A Georgia boy who stood to attention during the funeral procession of a slain police officer has been given a gift by the local sheriff’s department. Three-year-old Cohen Chastain saluted and waved on the street earlier this month as police honoured their fallen colleague, Detective Kristen Hearne. 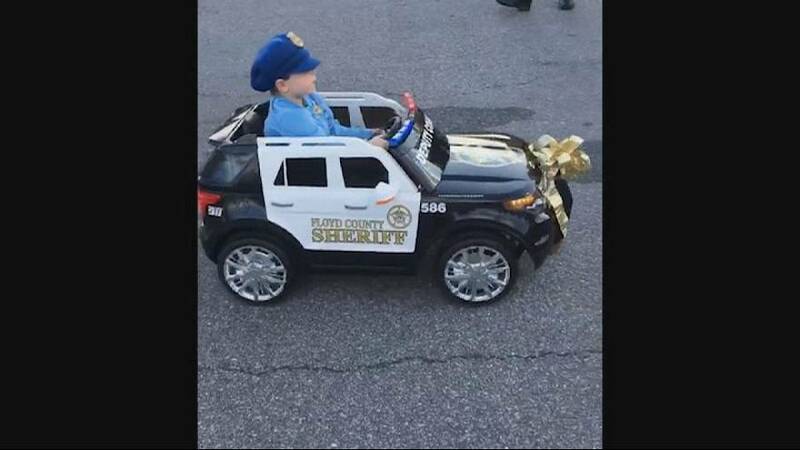 On Tuesday, the Floyd County Sheriff’s department gave Cohen an electric toy police car, which included a personalized ‘Deputy Cohen’ sticker on the front windshield and flashing red and blue lights. “We wanted to bless Cohen for his selfless act of support and love,” a post on the department’s Facebook page said. “But, once again, we were blessed by him beyond measure.” Video and photos posted to the department’s Facebook page on October 24 show the boy, in his police officer uniform, giving his new wheels a spin with a big smile. Cohen’s mother, Mandy Brooks Chastain, said her son wanted to attend the procession because he looked up to police officers, and thought of them as superheroes.